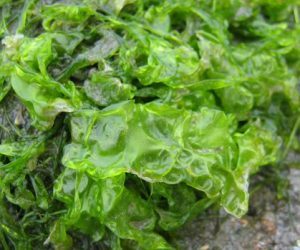 Algae: What are the uses and the useful substances? Algae – Whole plant – food!160 species of algae (Simpson) are used for food most coming from 3 genera (Porphyra, Laminaria, Undaria). Up to 75% of their dry bulk is indigestible. Nori – Japan since AD 533- 544; cultivation since 1623-49; when Japanese fishermen found bamboos pieces with it growing on them, and planted bamboo twigs into intertidal. Cultivated for centuries in Japan, Korea and China. Value $1 billion per year Extension of nori season by spore refrigeration + production increase from 8 people making 1500 sheets per day to machines that to that work in an hours. Undaria (qundai-cai – China; wakame – Japan) enhances calcium uptake from gut, promotes bone formation Diatom fossils used to filter sugar cane liquors and as anticaking agents in dried foods. AGAR – first referred to in Japan (1658) called kanten (meaning cold sky) because it was traditionally produced during cold weather. Supplies cut off from Japan during WW II, so allies had to find other sources. Commonest source now is Gelidium. Agar’s first use discovered by Frau Franny Eilshemius (a physician’s wife) whose husband told Robert Koch, who is credited with the discovery! Food – anti-drying agent in bakery goods; rapid-setting jellies and desserts in Europe, North America, Japan and China; temporary meat and fish preserved in tropics; thickening agent, emulsifier and stabilizer for sauces, soups, mayonnaise, cakes, beer cheese, ice creams and candies. CARRAGEENAN Chondrus crispus and Gigartina mamillosa (very similar and also known as Irish Moss) for carrageenan. Gigartina undulata and Gigartina clavifera in New Zealand. Euchema cultivation improvements in Philippines since 1971 has seen production from 500 metric tons/y to 25,000 metric tons/y. Algae are preferred over agar to stabilize emulsions in dairy products. Assists in suspension of cocoa particles in milk chocolate. Used in ice cream to prevent migration of colours in multi-coloured ices. Improves quality of soups, salad dressings, sauces, fruit drinks, etc.. Clarifying and stabilizing agent for beer. Known for a long time as a constituent of jellies, desserts, and milk puddings (blancmanges). Gelling, thickening and suspending properties are thermally reversible, or reversing states when solution is heated to a liquid and then cooled back to a gel. Very effective when is solution with proteinaceous materials. When added to hot milk, and cooled, bonds form between carrageenan and casein to give a creamy thick texture. This led to carrageenan replacing alginates for chocolate milk, yogurts, eggnog mixes and ice creams. Its high melting point makes it useful for making desserts in hot climates. It is immune to degradation by common enzymes (unlike cellulose gum). It is used as a binder in toothpaste and also makes teeth shiny. Preferred over agar to stabilize emulsions in paints, cosmetics and as a sizing agent in textile and leather industries. Used in aqueous solution to suspend oil-based inks to allow them to be combed or swirled to create marbleized designs on paper and fabric. Spirulina – a “blue-green” used for food in old (Lake Chad) and new world (Aztecs before conquistadores). Excellent protein supplement (72% of dry weight). 10 tons per acre (wheat – 0.16 ton per acre; cattle 0.16 ton per acre. A bit low in S- amino acids but superior to all plant protein sources and equal to meat or dairy products. Christopher Hills (UK) – dried alga for chicken feed with high protein and high carotene. Imperial Valley California and Kona coast of Hawaii using ponds in saline soil. In the west mostly the phycocolloids from algae are used as binders and emulsifiers in pharmacy and in wound dressings (alginate wools are absorbent). The use of algae reduce cholesterol – Sterols in Spirulina, Chlorella and Scenedesmus lower cholesterol. Laminaria japonica administered for hypertension – effect may be related to iodine. Spirulina is high in B vitamins, but >50g per day gives nausea unless tolerance acquired. Laminaria digitata and Dilsea edulis (red) have anticoagulant effects – claimed for carrageenans. Anabaena sp. (blue green) are part of the “green manure” in their relationship with Azolla, an aquatic fern found in rice paddies. Inoculation of 0.2 kg of Azolla per hectare is equivalent to 30 kg/hectare of commercial nitrogen fertilizer. Not as popular now because we have found that Azolla growth is limited by phosphate, which is non-renewable. Next break is low-phosphorus requiring Azolla. Many seaweeds are harvested for ash Na, K. Fertilizers generally rich in potassium and nitrogen but low in phosphate. Good complement to animal which is high in phosphate, equal in N and only 1/3 as rich in phosphate. Free of terrestrial weeds and fungi. Some liquid fertilizers, e.g. liquefied kelps marketed in BC by Wayne Temple and Reed Radley’s company. Soil amendment. – Records as animal manure substitute since 5th century AD. Charles II allowed people to collect for fertilizer. Easement of an ox-cart’s width allowed and show in records of Rhode Island. Chlamydomonas and other soil algae make mucilage that loosen compacted soil. Used on compacted ash of Mt. St Helens to restore farming. Chlorella – only microscopic green used commercially, but I can’t find a product or a use. In Europe and N. Africa, calcareous algae useful to reduce soil acidity. ALGINATES – colloid stabilizers in textile, cosmetic, pharmaceutical, paper and welding industries. AGAR. – Agar’s first use as a microbiological medium discovered by Frau Franny Eilshemius (a physician’s wife) whose husband told Robert Koch, who is credited with the discovery! More recent uses include, dental impressions, cosmetic base, and biochemistry – electrophoresis chromatography support. CARRAGEENAN – preferred over agar to stabilize emulsions in paints and cosmetics. Details of waste treatment (see Simpson, page 641) . Tertiary treatment can use algal – bacterial culture + light + sewage leads to bio-oxidation. Produces precipitated organic material (sludge) plus oxygen which maintains aerobic bacteria. Organisms absorb N and P from sewage for their own use. With photosynthetic oxidation BOD drops 90% and P drops 80% . Get some examples (check Iona, but Simpson quotes Hollister, CA. ).